The latest V-Grip range of foam-faced grippers from vacuum expert Simmatic provides a convenient and effective solution to the problem of reliably picking up irregularly shaped and porous objects. V-Grip grippers need only a compressed air supply to operate and can confidently be used to pick up even the most delicate of objects with minimal risk of damage. The grippers feature a strong but lightweight aluminium body frame, which makes them ideal for use on robot arms where the maximum load may be limited. Their gripping surface is faced with EPDM (ethylene propylene diene monomer) foam, which deforms in use to give an excellent seal irrespective of the shape of the object being picked up. The foam is also soft, ensuring gentle handling, and durable to guarantee a long working life. 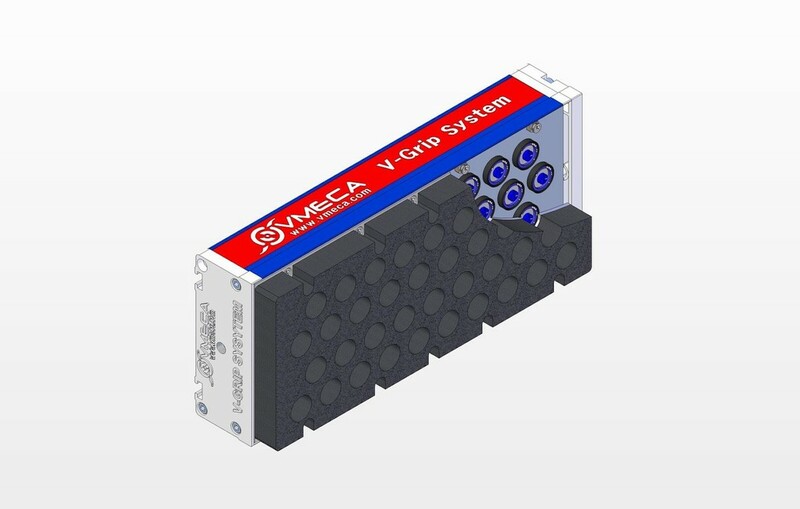 A key benefit of V-Grip grippers is that they have integrated VMECA vacuum cartridges, which means that they require no external vacuum pumps or vacuum pipework. This makes them easy to install and since the vacuum cartridges have no moving parts, almost no maintenance is needed. The grippers also incorporate air filters together with user-adjustable check valves that can be set to give a wide range of air flow settings, so, the lifting force generated by the gripper exactly matches the requirements of the application. GM-series products in the V-Grip range are 130mm wide and are available in various lengths from 220mm to 1200mm. Simmatic can also supply larger grippers with similar characteristics and features and for applications that require small grippers, the company offers the Mini Grip range. This features models from 16mm to 60 mm wide and as with the GM-series products, they can be supplied in a variety of lengths. As with all of their products, Simmatic backs V-Grip grippers with an expert support service, which includes providing advice and guidance on product selection, applications, installation and maintenance.